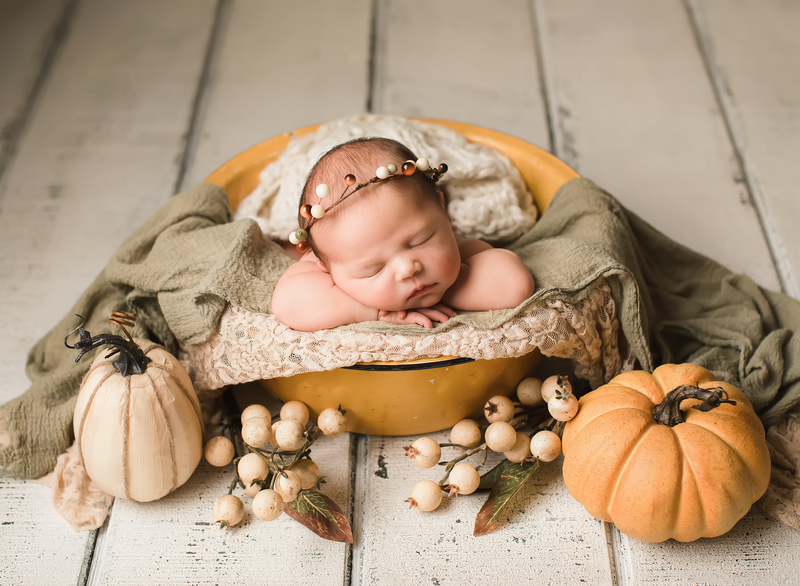 I love newborn photography and love the pureness of a sweet little baby. It always takes me back to when I had my babies and those are some of the best moments in my life. I love being with new moms and dads and experiencing the joy all over again with them. The newborn stage only lasts a very short while. I know, after months of no sleep it starts to feel more like an eternity, but trust me, you will look back and realize that your tiny little baby is not so tiny anymore, just after a few weeks. This is why I feel that newborn photos are so very important. It’s such a beautiful time to capture and it will be over in the blink of an eye! A newborn session is a lot more complicated than most other types of sessions. For this reason, I have created this page for you to know what to expect at your newborn session. Please read thoroughly and let me know if you have any questions! **Sessions must take place within the first 2 weeks so please, after booking your session, let me know ASAP when your baby has arrived, in case we need to move the session, since I have a family and a very busy work schedule and need to work around other session dates and my family’s schedule. Lots of moms and dads contact me while on their way to the hospital or while there. I love getting photos of the new baby from the hospital! -The most important thing to know is that a newborn session can take 3-4 hours, all depending on how easily we are able to get the baby to sleep and stay asleep. Be prepared! I recommend bringing something to read or do. These sessions involve a lot of down time involving rocking and swaying trying to get the baby soothed. Many parents want to give up at some point in the session. Please be patient and when I feel like we’ve gotten enough photos, I will let you know. Please don’t make any appointments for the morning or afternoon of your session so that we aren’t rushed to finish. –**Before your session, please try to keep baby awake for the hour before arriving, especially in the car, all the way up until you walk into the studio. This is the absolutely most important thing to remember from this list. We want baby to arrive ready to sleep. Try a bath or playing with baby. Don’t keep baby awake for more than an hour or they will be overtired. Babies that sleep just before the session don’t usually want to sleep at their session which makes the session very difficult and long. -Please dress baby in something that does not go over his/her head, like a button-up onesie. -When you arrive for your session, I will give you some space to loosen baby’s diaper and then feed your baby if your baby is awake or needs to be fed. After the baby is full and sleepy, we will start the session. I like to soothe the baby but if I need your help, I will ask. Please take this time to relax because after having a baby, you deserve it! I will ask for help with some props for safety reasons and will have a parent come sit by the baby while in the prop and keep a hand on them. *Again, safety is a huge priority of mine! -Please, if you are nursing or pumping, avoid coffee the morning of your session. It can make for a very restless baby. -I keep the studio very warm (80-82 degrees) since a newborn baby cannot regulate their body temperature like we can. So please dress comfortably. I do usually get photos with the parents (waist up) at the beginning of the session, so be ready for that. (Neutral colors look best on parents and siblings: creams, whites, or even black. Moms, simple tank tops/tube tops or dresses look really great in black, cream, or white. Sleeves can distract from the baby. Please avoid patterns, prints and stripes. For dads, a simple t. shirt is best in a color that is the same as mom’s. Older brothers look cute in jeans and no shirt or a white t. shirt while older sisters I can wrap in one of my wraps for a top with jeans, or a white/cream shirt/dress looks great.) Feel free to step outside to cool off at anytime! –**Please bring a pacifier (the kind not attached to a stuffed animal please), even if the baby doesn’t take one at home or doesn’t seem to want it. It can be extremely helpful and sometimes is necessary to get through a session to keep the baby content. -Your baby is the boss. If the baby is hungry, then we will stop everything for him/her to be fed, however often that is. Our goal is to make the baby as comfortable as can be. Most babies eat a lot more during a session than they normally would because they are being woken up so often. A full belly equals a happy baby. If your baby is bottle fed, please be prepared with a few bottles. If you need to pump, please don’t hesitate. Moms have pumped in the studio or in the bathroom. I am comfortable with whatever makes you comfortable. If nursing is not successful yet and the baby takes bottles, having a couple of bottles on hand can be really helpful. If a baby is hungry, chances are, he/she will not sleep. -I like to keep talking to a minimum so that we are able to keep the baby asleep. I have a sound machine in the studio to help keep the room as quiet as possible. When I’m posing your baby, for safety reasons, I like to have all of my attention on baby but love to chat when baby is eating and at the beginning and end of the session. -Your baby will have an accident on the blankets/props. Don’t fret. It’s something that I know will happen so please don’t apologize. It’s what washing machines are for, right? I suggest bringing an extra shirt for this reason. Babies do often have accidents on parents during the parent shots. -I have blankets, props, swaddling fabrics, hats and tie backs (headbands) already so no need to bring anything! I like to use props that I feel are safe and fit with my style. I love Pinterest as much as anyone but prefer to keep my photos simple and create my own beautiful images, to give you unique photos. Thank you for understanding. **I send out blanket and prop choices before your session so that everything can be ready when you arrive for your session. Once things are set up, I am not able to change or add anything, especially blankets because it would add too much time to your session. -I try not to swaddle babies for the whole session but sometimes it’s the only way a baby will sleep and be content. I follow the baby’s lead here and do what makes them happy. -I love to include siblings in your session. Siblings can be brought to the beginning of the session and we can do their photos first and then someone can take them home or somewhere to play. Siblings may not stay for the newborn-only part of the session unless they are over the age of 6 since my goal is to keep the studio quiet and peaceful. 3-4 hours is a long time to wait around in silence for the session to be over. Thank you for understanding. Mountain Playlodge is a fun indoor play place that is very close as well as Launch, the trampoline park, and Fun Depot. *Please let me know ahead of time if we will be doing sibling shots so that I can have everything ready. **Older siblings who are under the age of 3 may not want to do a photo with the new baby. I always try my best but sometimes it just isn’t possible and isn’t worth making your oldest child upset. Please see above about what they should wear. -There are lots of restaurants nearby if one of you needs to leave to get lunch and bring it back or please feel free to bring your lunch. I will have some snacks and water out also. -Please remove old nail polish before your session from fingers. It’s super time consuming to correct in post-processing. Thank you! After your session, I will begin working on your photos and will post a sneak peek usually that night. I will email you in about a week to let you know when your on-line gallery is ready and you may then order your prints straight from that site. Thank you for choosing me to take your baby’s first photos. It’s truly an honor! I look forward to meeting and working with you and your sweet baby!